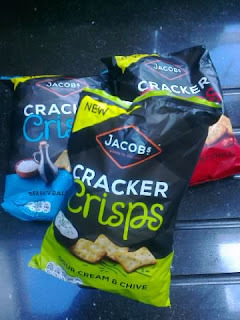 Jacobs Cracker Crisps are a new snack from the well known producer of crackers and I was asked to try-out this new product. Three packets of different varieties arrived yesterday and I shared the Sour Cream and Chive version with my partner. We both agreed that they were overcooked and far too salty. The salt dominated the taste and overpowered the sour cream and chive flavour. The 150g packet boasts, 'Oven Baked', 'No Artifical Colours' and 'No MSG'. However the oven baked crisps were brown in colour and darker at the edges, and so clearly were over baked. Not 'baked to delight' as the packet promises. Yes, they were crisp on the bite but the taste was not of sour cream and chives but of salt. The salt content is 1.8g per 100g which is high and the fat content is 19.6g per 100g, so clearly not a 'low fat' snack. In simple terms, the taste of the small crisp squares was boring. They also left a coating of greenish debris on my fingers which was not pleasant and an immediate hand-wash was required. I wont be purchasing this snack in the future, which according to the packet, is 'just the thing to indulge in after a busy day'. It is more 'just the thing to avoid for healthy living, whether after a busy day or a relaxing one.' I was not Snack Happy, Jacobs! Another snack joins the host of crisps and biscuits crowding the supermarket shelves but adds nothing. Jacobs can do a lot better than this and putting their name to this low key new snack is to undermine their reputation as a producer of quality cheese biscuits.